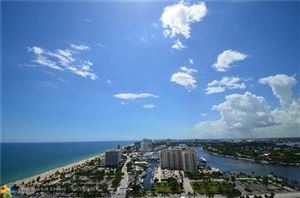 Jackson Tower is located just north of the city’s well-known Las Olas Boulevard, in Fort Lauderdale. It stands thirty stories tall with views of the Atlantic Ocean and Intracoastal waterway. Its proximity to Fort Lauderdale’s sun kissed beaches have secured its place amongst the most in demand properties in the area. Upon entering the two story grand lobby and throughout the property you will likely be struck by the architecturally distinct landscaping with its uniquely South Florida vibe. It contains a heated swimming pool, serene fountains, a sun deck, private elevators and a health spa with exercise areas overlooking the ocean. Choose from one to three bedroom configurations featuring open floor plans space (the third bedroom is a den). Jackson Tower interior features include floor-to-ceiling glass doors, wraparound terraces and custom security systems. Those technologically minded will appreciate surround sound system that extends outside and is hidden amongst verdant potted plants. Kitchens are expertly appointed with European cabinetry and granite countertops, baths come fully equipped with Jacuzzi tubs and separate showers. Views are appreciated from nearly every bedroom with access to terraces. The Jackson Tower condo offers a stunning location in close to beaches, shopping, gourmet and casual dining. For those looking for an active nightlife, the Las Olas district and downtown Fort Lauderdale are nearby with many lounges, restaurants and museums to choose from. Close-by is the Fort Lauderdale International Airport as well as interstate 95 with access to all of South Florida and beyond.